ITV CEO Carolyn McCall says people who stream are interested in another subscription for British content. BritBox, the streaming service by ITV and the BBC, will launch later this year in the UK and be completely free of advertising, ITV chief executive Dame Carolyn McCall said today. In an earnings call this morning following the release of ITV’s full-year financial results, McCall insisted that BritBox would not be a competitor to streaming giant Netflix, but would be a complement. Like Netflix, BritBox will not run ads and will be paid for by subscription. ITV and the BBC have not yet announced pricing, but have said "it will be competitive". "It will be completely ad-free with a subscription and there are no plans to have subscriptions outside of Britain," McCall said. "If we have an agreement with the EU and you are a British subscriber, you will be able to watch it in the EU when you go on holiday." Today, ITV and the BBC announced that they are in the "concluding phase" of talks to establish a partnership to deliver the streaming service in the UK. BritBox was launched in the US in 2017 and reached 250,000 subscribers in its first year. 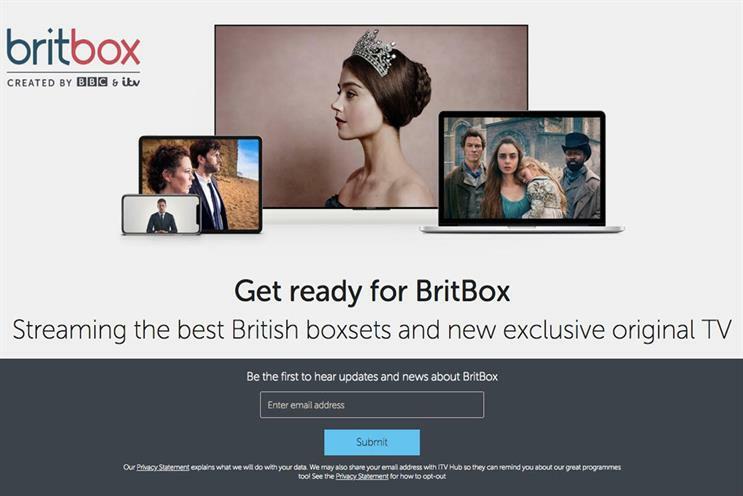 The broadcasters want BritBox to provide "an unrivalled collection of British box sets and original series, on demand, all in one place". ITV’s net investment in BritBox will be up to £25m in 2019, rising to "around £40m" in 2020 and declining thereafter. McCall would not comment on how much the BBC would provide in terms of funding relative to ITV’s commitment. "The majority of costs will be on content and customer acquisition," McCall said. She added that the next steps for establishing BritBox will be "talking to regulatory bodies", as well as holding discussions with pay-TV broadcasters Sky and Virgin Media about content deals. When asked how Britbox can hope to compete with Netflix, which was estimated to be spending $13bn on commissioning content in 2018, McCall insisted the new service would not be a competitor to the US giant. "This is not the equivalent of Netflix, who commission globally. When they look at content, they look at it working in many different markets. We’re looking at it working in the UK. "It’s complementary to Netflix and doing a very different thing. When you look at research, 12 million households have at least one SVOD service… 43% of all online households are interested in subscribing to a new service that features British content and that increases with Netflix homes to one in two. "They are looking for an additional service that features British content. We are not a substitute for Netflix; we are a complement to Netflix."